The museum is located in the town of Lacco Ameno with entrance on corso Angelo Rizzoli. The museum’s location is in the main building of Villa Arbusto. Originally built in 1785 by Don Carlo Acquaviva, Duke of Atri, this villa was purchased and brought to its splendor in 1952 by Angelo Rizzoli, after different owners threatened its original splendor. Angelo Rizzoli, who made Ischia world-famous with his movies and passion for creating the island as a chic tourist-destination. The idea to use the structure as a Museum was generated by Professor Vincenzo Mennella, the mayor of the Lacco Ameno commune,who, in collaboration with the Province of Naples and the Authority of Archaeological Heritage, arranged for the building to be purchased by the heirs of the Rizzoli in 1978. The actual museum was opened only after 21 years in 1999, and its current building is divided into eight rooms. Inside there are all archaeological relics found on the island, from the neolithic to the classic age. The relics both of the Greek period and of Roman times, come from the nearby excavations of Santa Restituta. 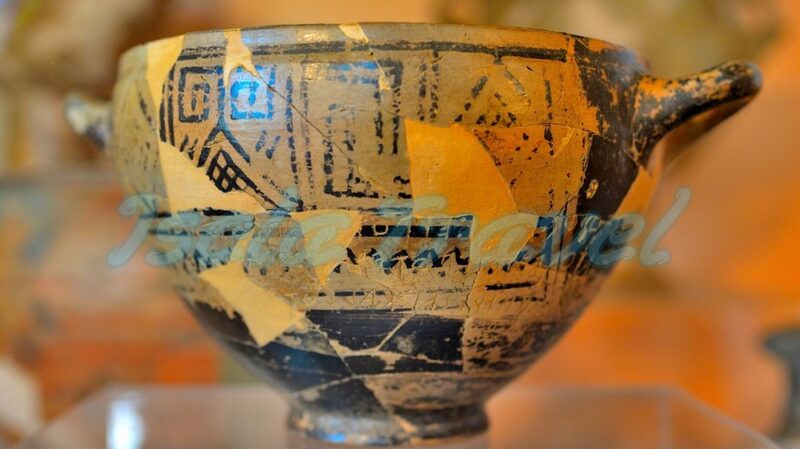 Overall the most important archaeological find is the famous ‘Nestor’s Cup’, a small cup made of clay that dates back to the 8th century BC, with its lateral engraving of an epigram “Of Nestore …. the cup good to drink of. But who drinks from this cup, immediately will be taken with a desire of love for Aphrodite by the beautiful crown “represents, as well as the famous Homer’s poems, the first fragment of the poetry preserved in its original writting and one of the oldest texts written in Attican Greek, which is studied in High School. Inside the villa there is a room dedicated to the memory of Angelo Rizzoli, with a photo gallery of the events and the Vips hosted in Ischia. The garden of the villa is also very beautiful ,it is a wonderful example of the Mediterranean flora widely represented throughout the area by olive trees, laurel trees, pines, pomegranates, oleanders and a shrub of the strawberry tree located at the entrance of the villa. Signs to each part of the museum are made out of beautiful, locally-made ceramics which were also used to create a pair of pretty and unusual benches. The Villa Arbusto Museum is located in a hilly area overlooking the beautiful town of Lacco Ameno. Entry to the museum is €5 or €3 for over 65's. For group tours of more than 10 people the ticket price is 4 euro per person. For guided tours a previous reservation is needed. It is opened from Tuesday to Sunday (Monday closed) from 9:30 am to 1:30 pm. Do you want to visit "Pithecusae’s Archaeological Museum"?